At the Sleeping Giant Loppet we want you share the podium with your friends and family. Come and participate in one of Northwestern Ontario's most loved winter events and get a photo on our podium with your family, team or training partners. The Loppet, was known for many years as the Sibley Ski Tour. The Sleeping Giant Loppet is a mass participation ski festival that offers fun for the whole family and challenges competitive athletes. The Loppet takes place in the beautiful wilderness setting of Sleeping Giant Provincial Park. It features multiple events with distances for skiers of all levels and abilities. Our 8km Mini-Loppet is perfect for families, children and rookies. If you're ready to increase your distance or work on your speed, then the rolling 20km Marie Louise Lake loop is for you. The popular 35km Tour is a relaxed event that takes in the scenic vistas and killer climbs of the storied Burma Trail. For the ultimate challenge, register for the Loppet's flagship event, the 50km Classic or Skate distance. The 50km is perfect for elite skiers vying for one of our generous prize packages or citzen racers looking for a PB. Mark March 7th, 2015 on your calendar and we'll see you at the start of the 38th annual Sleeping Giant Loppet! The Sleeping Giant Loppet takes place Saturday March 5, 2015 in the serene wilderness of the Sleeping Giant Provincial Park on the groom trails prepared by the Thunder Bay Nordic Trails Association. So register now to participate in one of Northwestern Ontario's most loved winter events; and get a photo on the podium with your family, team or training partners. Whether you are an avid cross-country skier or just looking for a taste of Nordic culture, you will want to come to Thunder Bay and be part of this popular mass participation ski festival. This year could be the year that Loppet breaks the 1000 entry mark with skiers expected from Manitoba, Wisconsin, Minnesota and communities across Northwestern Ontario. Peter Gallagher introduced the Loppet’s newest event a 50km Skiathlon that caters to those participants who can’t decide if they want to skate or classic ski. “You Classic the first 22km to Checkpoint 3, where your skate equipment will be waiting and after a quick change of boots and skis, skate the remaining 28km to the finish.” explained Gallagher. Loppet committee members also highlighted a new offering of cash prizes for the 50km free 1st, 2nd and 3rd place finishers, as well as a grand-prize attendance draw for a one-year lease of a Nissan Rogue-all courtesy of Halfway Motors Nissan. Organizers want to assure all participants that they will be receiving on of the popular chocolate finishers medals, courtesy of Nordmin engineering. The event wrapped up with expert groomer, Peter Crooks assuring attendees that the Loppet trails would be in world-class conditions for the 39th edition of the Sleeping Giant Loppet. 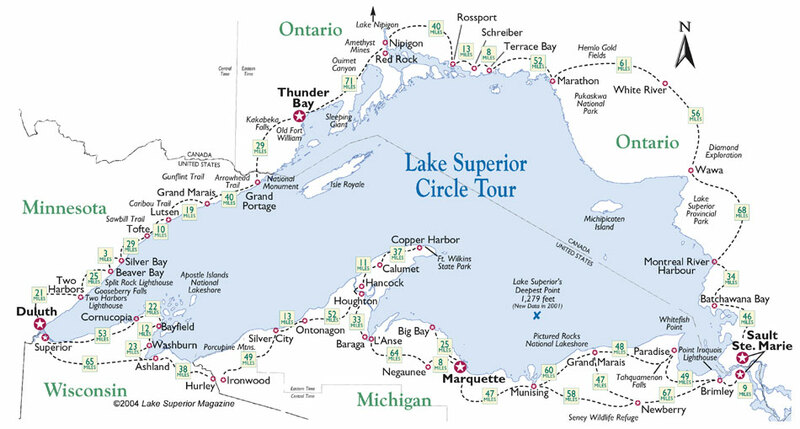 The Lake Superior Circle Tour (LSCT) in northern Wisconsin (highway 13), loops around Lake Superior state highways in the US states of Michigan, Minnesota (highway 61) and Wisconsin and provincial highways in the Canadian province of Ontario (highway 17). These highways are usually the closest to the lake.